, doctor regent of the faculty of medicine at Paris, where he was born in 1634, was educated not only in the learned languages, but in painting, music, and other elegant accomplishments, and exhibited early such traits of genius and learning, that Guy Patin, not in general very lavish of praise, considered him as one of the most learned men of his time. 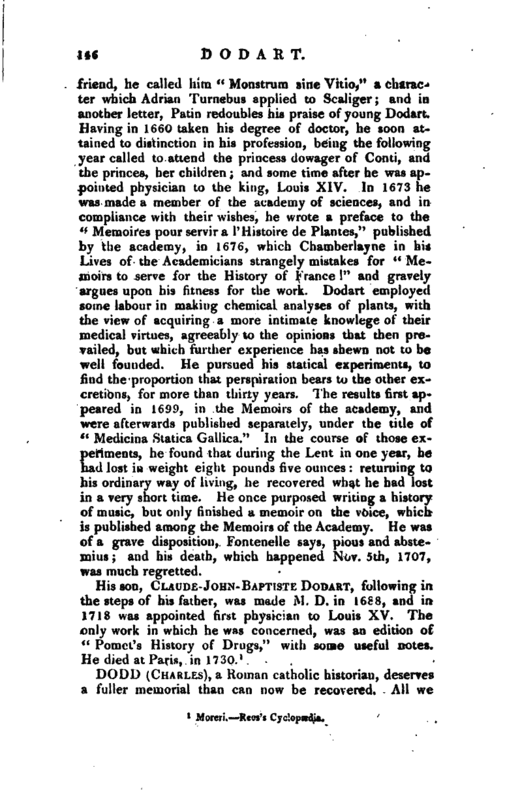 In a letter to a | friend, he called him “Monstrnm sine Vitio,” a character which Adrian Turnebus applied to Scaliger; and in another letter, Patin redoubles his praise of young Dodart, Having in 1660 taken his degree of doctor, he soon attained to distinction in his profession, being the following year called to attend the princess dowager of Conti, and the princes, her children; and some time after he was appointed physician to the king, Louis XIV. In 1673 he was made a member of the academy of sciences, and in compliance with their wishes, he wrote a preface to the “Memoires pour servir a l’Histoire de Flantes,” published by the academy, in 1676, which Chamberlayne in his Lives of the Academicians strangely mistakes for “Memoirs to serve for the History of France!” and gravely argues upon his fitness for the work. 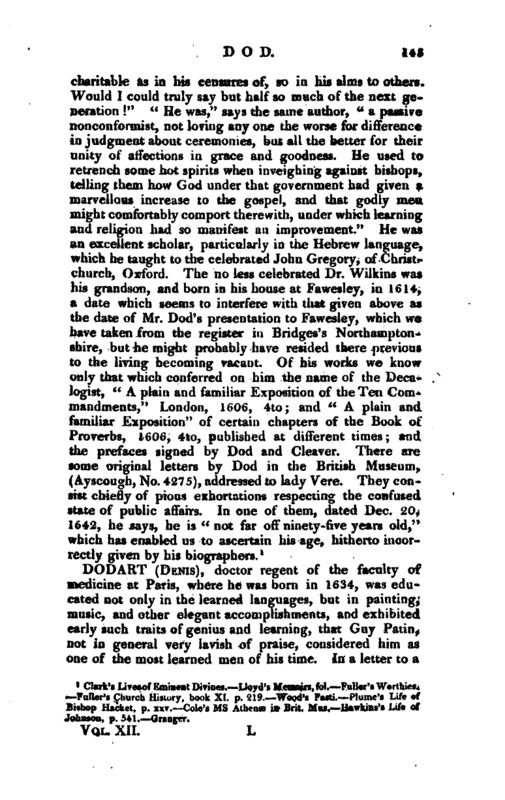 Dodart employed some labour in making chemical analyses of plants, with the view of acquiring a more intimate knowlege of their medical virtues, agreeably to the opinions that then prevailed, but which further experience has shewn not to be well founded. He pursued his statical experiments, to find the proportion that perspiration bears to the other excretions, for more than thirty years. The results first appeared in 1699, in the Memoirs of the academy, and were afterwards published separately, under the title of “Medicina Statica Gallica.” In the course of those experiments, he found that during the Lent in one year, he had lost in weight eight pounds five ounces: returning to his ordinary way of living, he recovered what he had lost in a very short time. He once purposed writing a history of music, but only finished a memoir on the voice, which is published among the Memoirs of the Academy. He was of a grave disposition, Fontenelle says, pious and abstemius; and his death, which happened Nov. 5th, 1707, was much regretted.